During the last decade there have been impressive advances in the way homes are constructed, especially as it applies to the areas of technology and building science. But the application of these practices can vary greatly from one builder to another. As a result, FGBC has created green building standards that allow it to certify that a builder has applied the industry’s best practices for sustainable, green construction in Florida. Enhances the profitability of resale. Gain valuable promotion and advertising. Conservation of water resources. Enhances the affordability of operation Differentiate your home from the competition. Management of waste and stormwater. Enhances the indoor air quality of the home. Homebuyers link green home features with quality Provide / maintain affordable housing. Provides for greater access to mortgage money Add to the marketing value of your homes. Builders across Florida have found FGBC’s residential green standards to be very effective and easy to implement because they are adaptable to each home’s unique construction requirements. The FGBC Green Home Standard is applicable to single-family homes and multi-family buildings 3 stories or under. 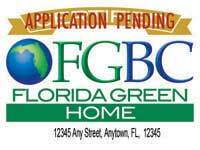 Order forms are available in the FGBC Green Home Checklist file. Certifying Agents and builders: Order an FGBC Certified Green Home "Application Pending" yard sign to promote your project during construction and a bronze plaque that can be permanently affixed to the home once it is certified. What a great way to promote your green building advantage! Use the FGBC "Make Your Next Home an FGBC Certified Florida Green Home" sign at any location to promote green home certifications in your area. Download. Download the "Florida Green Certified Home" brochure. 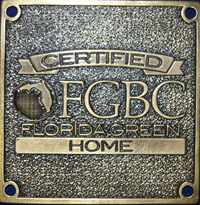 The FGBC Green Home Standard indicates the criteria by which a Florida home, new or existing, can be designated green. Certifying Agents can guide designers, builders or homebuyers through the process of qualifying and documenting green homes. By choosing to build green, you have chosen to reduce the burden on the environment and add value to your home through a voluntary Florida green home designation as administered by the Florida Green Building Coalition. FGBC's purpose is to provide you with the tools and guidance necessary to help you please your customer, as well as reward and promote your efforts as a Florida friendly builder. Why should you support a green design designation? Many homeowners are desiring and some insisting that their home be earth friendly, affordable to operate, and healthy to live in. FGBC's Green Home Standard is a tool that will guide you and your customer through the process of selecting green features that are cost effective, benefit the environment, and will fit in with your current practice. The standard has been developed such that it is achievable by everyone and will be recognized as a statewide industry standard. The Florida Green Home Standard Checklist and Reference Guide can be downloaded using the links on this page and will help an FGBC Green Home Certifying Agent provide an evaluation of the home. The FGBC Green Home Checklist is detailed to new home and existing home requirements. The FGBC Green Home Reference Guide goes along with the Checklist and is intended for two purposes: to provide information on green home practices and provide details on how to earn points for complying with the Florida Green Home Designation Standard. All FGBC Green Home Certification applications must be submitted to FGBC by an FGBC Certifying Agent with an" active" status. The status of Certifying Agents can be verified on the FGBC website under the SEARCH tab. After the home has been evaluated using the checklist and reference guide, the Certifying Agent will organize a packet of all the required and suggested submittals to be sent with the application. Letters, documents, documented verbal communication, floor plans, etc. are all welcome. Included in the packet must be a copy of the standard checklist (please make sure all signatures and addresses are completed on the back page), a financial interest disclosure form and a check made payable to FGBC. All submittal packages must now be submitted in an electronic format on CDs or via an online service such as YouSendit.com or DropBox.com. Hyperlinks from the Checklist line item to the supporting documentation are preferred, but not required. The application package will be reviewed for compliance and if there are any questions the Certifying Agent will be contacted. Reviews are usually completed within 2 to 3 weeks. Upon certification, the Certifying Agent will be mailed an FGBC Green Home Designation certificate for distribution to the project owner. Refer to the FGBC Green Home Designation Standard documents for current fees. Discounts are available to FGBC and FHBA members. Please refer to the Standards "Policies" document for complete information on the modification process. Proposals to change the Standard may be submitted to FGBC using the "Modification Request Form" available in the downloads section on this page.